Pour rum into a glass with ice. 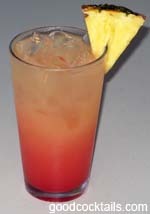 Fill it with equal parts of pineapple juice and grapefruit juice. Add grenadine on top.